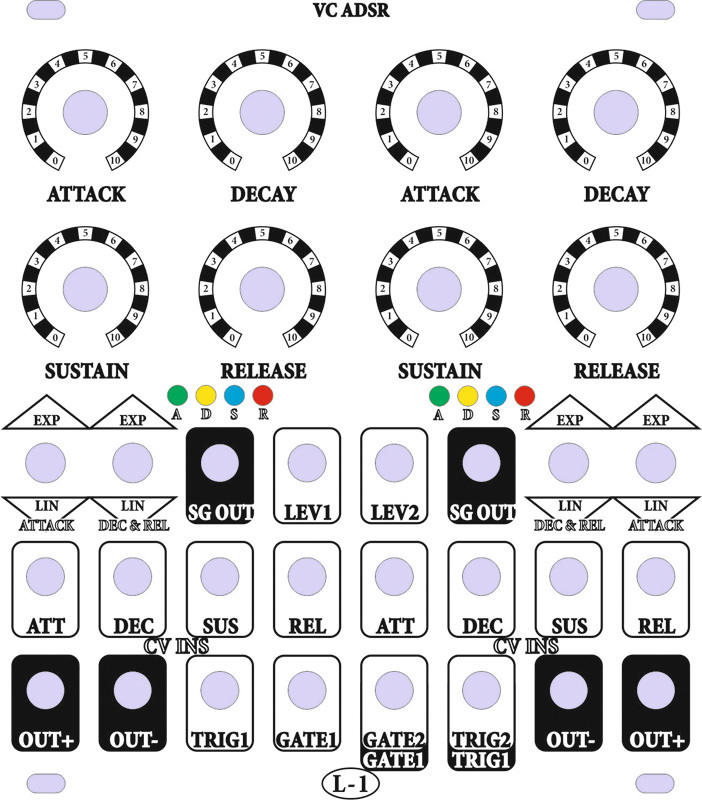 MUFF WIGGLER :: View topic - [IN STOCK] L-1 VC ADSR, Mouser cart added, page 5. [IN STOCK] L-1 VC ADSR, Mouser cart added, page 5. 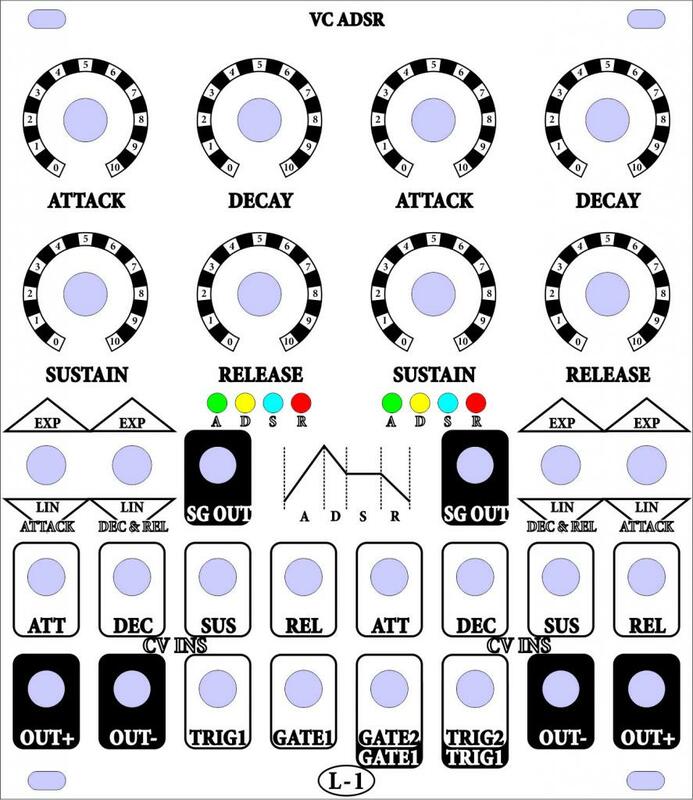 I'm very like this true analog concept and want to make an eurorack project based on it. 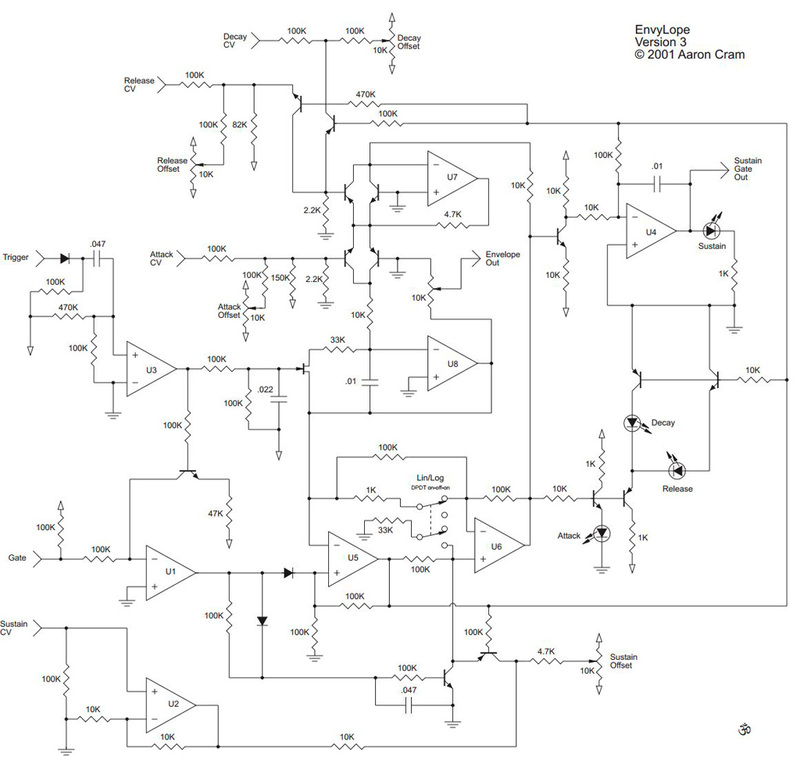 Aaron Cram written on this schematic 'fair use granted'. Can't deeply understood this phrase. This use I want is 'fair' or not. No chance to find Aaron and ask him, his site and email don't work anymore. So I need an advise from wigglers - can I use this circuit or no. I just don't want anybody says 'He took not their and earn money on it'. I made some changes in circuit. Now it works well on simulation. - expo mode worked not correct (maybe it's a reason why Papareil removed it in his project). I made it in a different way. - will tweak attack decay release to have ranges: attack 0.1ms - 10s, decay and release 1ms - 20s. 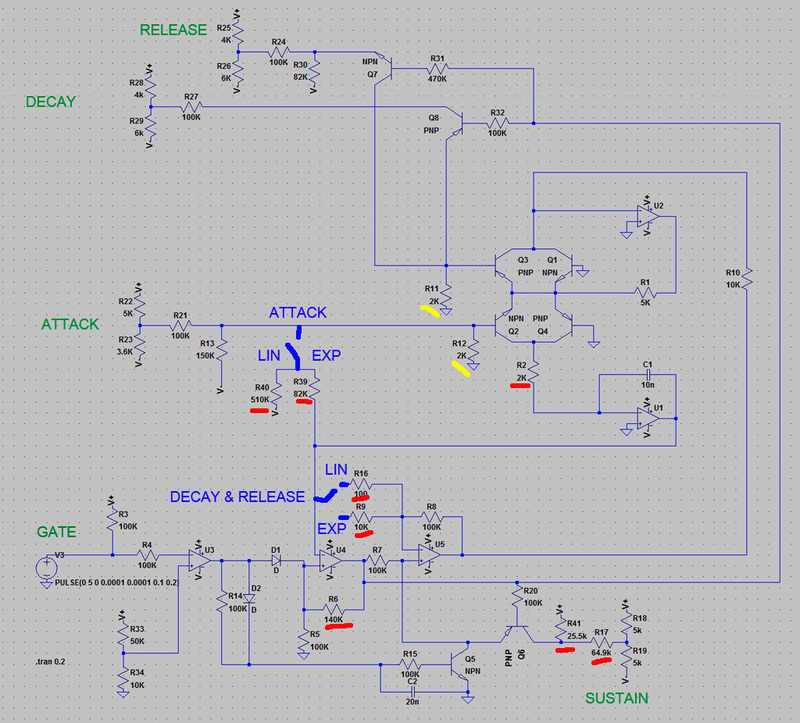 This is schematic I simulated. No trigger input, sustain gate out and LEDs yet. I marked red parts I added or changed. By analogy with other expo multipliers I think these 2K I marked yellow must be tempco. Don't know how to check this, will heat up a prototype and see ..
Panel I wan to make. 22HP. I hope to place everything on one board. Fair use is permitted without permission of the copyright holder, as long as it promotes the "progress of science and useful arts". I'd love to get an ADSR with CV control over all the stages. the problem with the concept of fair use is that it's usually court that decides if copyright has been violated or not. in any case, a schematic can not be copyrighted, only patented. so from a legal perspective you can just go ahead with the project. My research shows he helped his brother Dustin on the electronics for the Stepperature. so there is your lead. IÃ‚Â´m interested in licensing his portamentiometer design in a VCLFO with ramp/saw/tri/vcpwm with the option of VC lag. I have the board in from itead just last week to beta. 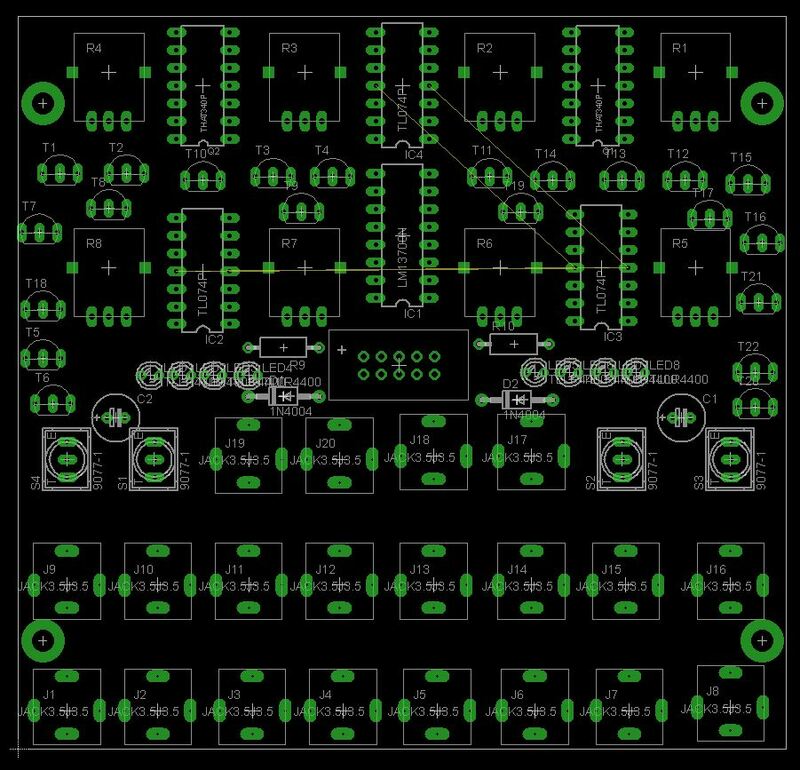 As per Paul's interview, the schematic, and for that matter PCB layouts, are copyrightable - but easy to get round by redrawing, making some changes here and there. Just don't stick in a photocopier without the copyright owner's permission. Patents are trickier. You can't just look at a schematic and say if any of the intellectual property embodied in that schematic is covered by one or more patents. You find out either by searching (and then either licensing or working your way around the patent), or not searching and waiting for a letter from the patent owner. The worst thing you can do is do a search, find a neat idea in an active patent, then use it without permission --- triple damages!!!! That would be an awesome module to add to the L-1 line! I would definitely buy several kits for it next year if it goes ahead. Very cool. I was wondering whatever happened to Aaron Cram. He posted a few interesting circuits like ten years ago and then basically disappeared from the scene. I borrowed parts of his LM13700 ring modulator for my own. With a few changes (minor ones.) I'm not selling it commercially though. (I've made maybe 5-10 of them.) It's also taken mostly from the 2 quadrant multiplier (amplitude modulator) from the LM13700 datasheet, so I think that makes this one a bit more fair to use. However, I do credit him as L-1 is here. I did a quick search to ask permission, but didn't find much. However, it looks like Piedwagtail has found a lead to work from. I'd love to get in contact with Aaron just to make my RM official. It's really the only design that isn't my own that I haven't managed to contact the original designer for. Anyway, this one's probably ok, but permission is always better. That's just my thoughts on it. Beautiful rework L-1! Two of these and your Quad VCA/Mix would be a lot of fun for a complex patch. FWIW, many years back I had some email correspondence with Aaron about the Portamentiometer. In a nutshell, he said that you should expect a Ã‚Â±7.5V triangle swing in LFO mode with Ã‚Â±15V supplies, and that the expo converter for CV of Rate can be a bit touchy to get working. IIRC, as it was a Ã‚Â±12V design, some component tweaking in the expo converter might be needed to get it to to run well on Ã‚Â±15V. A couple of years later, someone who knew him was in contact via electro-music.com, and said that Aaron was now far from SDIY, had moved on, and was not really contactable any more. As far as I know that's still the case. Aaron was a nice chap, knowledgable and helpful. I've followed the link Piedwagtail posted and found contact form. I written Aaron about his opinion about 'fair use' and permission. Hope hi will answer.. I forget about LEVEL CV, it's needed for velocity patching. So without those funny ADSR picture now. what's the envelope response sound like? been trying to figure out how to make a Pro-One ADSR w/CEM3310 and all because i have never heard a single envelope come close to it (which seems crazy but if you've used a pro1 you know it's pretty much true). i would love to have attenuators for CV inputs normalled for feedback slope control, even if just for attack/decay. not an easy thing to do with a dual ADSR in this size i know... i just find i adjust curve every time i use an envelope that has attenuators on board (especially when exponential setting is "too" exponential). Don't know how it will sounds, I'm only on software simulation stage. But hope will sounds great. Now can only show how it looks. No place for CV attenuators, sorry. I must use DIP chips and trough-hole parts, except of resistors and ceramic caps which I use big 1206 too. It's to allow the project be DIY. You can use AT-AT-AT device from Thonk to attenuate. I spent much time tweaking ranges but now they are as I wanted. Why is the ATTACK setting scaled in kilo-Ohms (or milli-Siemens "mS")? 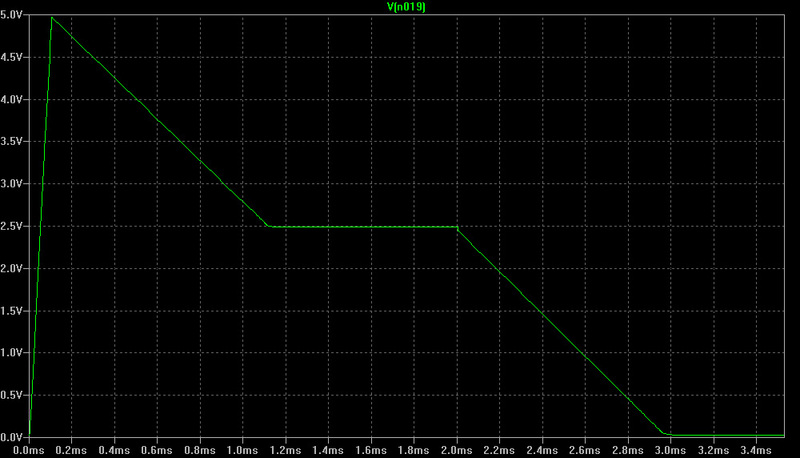 At the moment I'm trying to work out why it outputs 0.15v when idling, but can still go to 0v if it has an active gate signal and the sustain is set to zero. I'm very glad, and start to spend money on this my new project. Thank you very much, Aaron! Aaron here. Yes, you are welcome to use my circuit design in the way you described. Thanks for seeking me out and asking! If you publish your design that is based on mine, I just ask that you not charge for the schematic itself (ie give away the information for free) and give me credit by saying something like "based on a design by Aaron Cram" or something like that. I welcome "commercial use" of my designs. I've already figured how everything will be located. It easy fit one board. I want THAT340 arrays in the cores, but regular 2N3904 and 06 will fit these footprints too. Fantastic news that you located Aaron, and he was so cool about using his circuit. Both of you deserve a big for the dignity and class on display.